Although the mandatory wearing of seatbelts significantly reduced fatalities and serious injuries resulting from car accidents, many belted occupants were still suffering injury when their head hit the dash or steering wheel. It is in the prevention of this type of head trauma where the introduction of airbags has played a substantial role. However, it should be noted that airbags are designed to be used in conjunction with a properly worn three-point seatbelt, and without this latter constraint, preventable injuries will continue to occur. When an accident occurs, there are essentially four types of impact that may result. The airbag is intended to affect (#2) the impact between the vehicle’s interior and vehicle occupants. Airbags are electronically connected to the sensors in a vehicle which are able to detect when a collision is occurring. If a collision is detected and the vehicle is moving at a speed that triggers the airbag to respond, the airbag (which is essentially a deflated balloon) inflates under high pressure and in less than one twentieth of a second. The front air bags inflate in the event of a head on (or sometimes, angled) collision, and their purpose is to protect the head and chest area of vehicle occupants. The driver airbag deflates and offers protection from the steering wheel. Other airbags are intended to provide protection against hitting the dash or side panels. It is crucial that the airbag sensor is set exactly right so that low energy crashes are not missed, but at the same time, the airbag should not deploy in the event of minor bumps. The timing of inflation must also be exact so that the airbag is inflated to its maximum size just as the vehicle occupant hits the airbag; if it deflates too soon or too late, the occupant may strike the wheel or dash. Most studies on airbags and injury have concentrated on front-end collisions because these constitute more than half of all crashes (50-65 per cent). Also, when struck from the front, a vehicle occupant tends to be thrown forward and it is then that front airbags play an important role in protecting occupants. In contrast, when struck from the rear, it is the seat belts and head restraints that play the greatest role in occupant safety. Because airbags inflate so quickly, the force of the airbag can cause minor injuries such as bruises. A review of crash data between 1980-1994 by the National Highway Traffic Safety Administration (NHTSA) found that of the 618 injuries sustained due to airbags, 96 per cent were classified as minor. Of these, most injuries affected either the face or upper limbs. In rare cases, airbags have resulted in broken bones or even death if the person’s head or chest violently strikes the dash when the air bag is inflating. The chance of serious injury from an airbag is significantly reduced if vehicle occupants wear a seatbelt and if drivers sit far enough away from the steering wheel. Children under 12 should be seated in the back seat of the vehicle as their smaller size makes them more vulnerable to injury when an airbag deploys. On the whole, airbags have been proven to significantly reduce both the incidence of fatal injuries and the severity of injuries, particularly facial and head injuries. A 2003 Canadian study focusing on head injuries found that a driver’s chances of incurring a head injury were not substantially lowered as a result of airbag deployment, but the severity of head injury, including traumatic brain injury and face fractures, was significantly lowered. A study by the National Highway Traffic Safety Administration (NHTSA) agreed with the finding that the most important benefit of the airbag is a reduction in the severity of brain injury. However, studies have found no reduction in the incidence of brain injuries as airbags were shown to often cause mild concussion. In a U.S. National Center for Biotechnology Information (NCBI) publicbbation, based on a study of 200 accident victims, it was found that the presence of frontal airbags halved the number of thoracoabdominal injuries caused by steering wheel intrusion. Frontal airbags also reduced lower extremity fractures by about 25 per cent, but did not measurably reduce pelvic fractures. Further, in front-end collisions, airbags did not prevent lower extremity fractures that result from impact or intrusions with the instrument panel or floor pedal structures. Although airbags have been around for well over 50 years, they have been standard issue in cars only in the past 10 to 20 years. During this time, there have been improvements in the functioning of the triggering force, inflation rate and gas volume, which have resulted in fewer injuries and improved occupant safety, even since some of the above findings were released. Airbags undoubtedly save lives and reduce serious injury, but it is well documented that injuries sometimes directly result from airbags. And although the vast majority of these injuries are considered minor, even a ‘minor’ concussion can sometimes have long-term effects on an accident victim’s life if they suffer symptoms such as chronic headaches, difficulty concentrating or depression. Anyone who was injured in motor vehicle accident, whether or not their injuries were mitigated by, or resulted from the deployment of an airbag, is entitled to seek injury compensation. In Ontario, a person injured in a motor vehicle accident - drivers, passengers, pedestrians and cyclists - is entitled to receive statutory accident benefits under the vehicle owner's insurance policy. 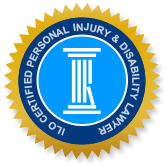 If your injuries resulted from a negligent driver action, you may also claim damages in a civil suit, to compensate for any losses resulting from your injury, such as lost income, rehabilitation expenses and general damages for pain and suffering. Call a knowledgeable ILO car accident lawyer in your community to find out about your legal rights in this matter.